Rye Monster Ruckus – MostlyAboutBeer……..
Rye beer has become increasingly popular over the last few years; a regular in brewery portfolio line-ups. I often have it on cask under 5% ABV. To over-generalise, I get an initial peppery taste from the head. As you down the ale, a deep candy sweetness develops and it’s usually thick-bodied – too filling to make it sessionable. The preceding thoughts are what I’ve come to expect but I want to see what shapes the mad hands of craft brewing can pummel it into. This monster rye ruckus starts from 7% ABV and climbs to 10.6% and I suspect it’s going to depart from the usual script. Both Ryesing Tides by Siren Craft Brew and Double Rye IPA by Brouwerij Kees categorise themselves as rye IPAs. 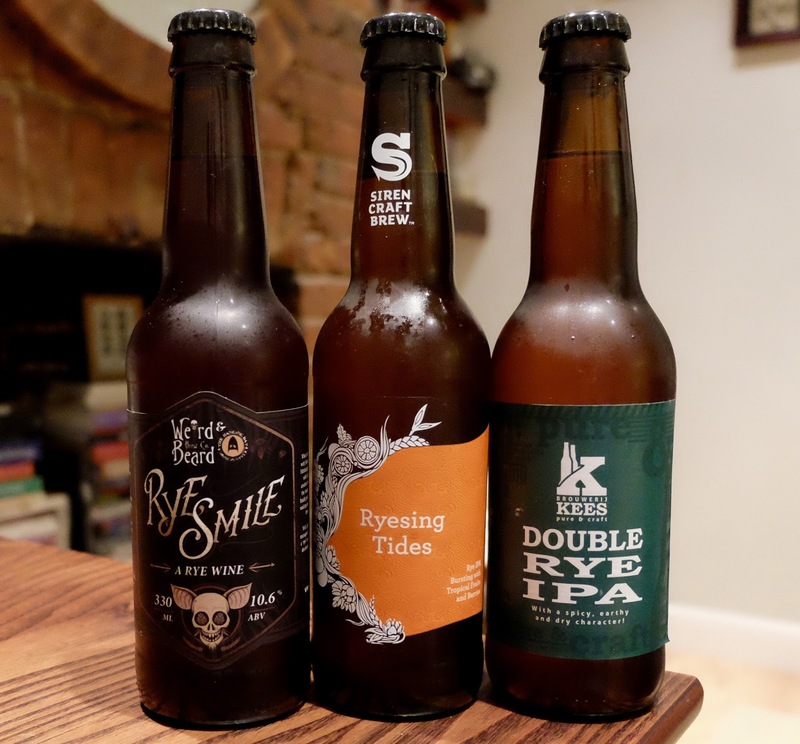 Rye Smile – a collaboration brew between Weird Beard Brew Co and Hanging Bat Brew Co calls itself a Rye Wine – second cousin to our Barley Wines. Ryesing Tides has been hopped with Smile (a new one for me) and Mosaic. The ale pours the colour of polished pinewood. On the nose there’s a bouquet of bitter orange zest and pale apple flesh. The analogous orange continues into the first sip as the pith hits the palate. Very quickly, you sink into a clay-like seam of sweetness. There’s even a touch of caramel. It has an amazingly clean body – it’s like drinking in high definition Blu-Ray. It has adequate carbonation to keep itself refreshing but overall it’s very steady and matt. The notes you get within the first minute remain constant throughout the sitting. The only added note I get is of a faint chalk aftertaste that just adds to the boreal seam analogy. The alcohol comes through gradually as a happy warmth. Kees’ Double Rye IPA, apart from rye, was malted with Pale malt. It keeps the identity of its hops a secret but does divulge they’re American. The beer’s also been dry-hopped with bittering and aroma hops. It glugs into the glass mid-amber. You inhale a sweet orange mousse. This is also the beer I get the cracked black pepper hit off when I initially sip it; a hors-d’oeuvre as it gives over to lemon pith and a chewy fruity bitterness. It goes beyond citrus, though. There are cherries and cute little red fruits – the tangiest, lightest and friendliest you can think of. Kees’ beer’s body is a vat completely filled to the goiters with fruit. You sip it, there’s a pause, and the notes start to rise again like the voices in a children’s choir coming back to the chorus. The Rye Smile uses Pale, Munich and Crystal malt as well as rye. The hops are Centennial and Columbus. The liquid decants a crimson blood/beetroot and is garlanded by an off-butter lily head. This head will remain, gluey and glossy, right to the bottom of the glass with near-geological stratification. The menacing aroma is of alcohol lurking under the cover of brown sugar. There’s a more pungent sourness too that the alcohol carries: stewed rhubarb. On the first careful swig, the alcohol is still apparent. There’s a touch of citrus but it’s subservient. The boozy warmth remains its main character. This beer’s body is very malty and it mops up some of the strength. The mouthfeel is very thick and quite oily. It’s obviously a different style to the other two beers. When you drink this ale, there’s an uncomfortable feeling like someone you can see at the periphery of your vision staring at you on the tube. Ryesing Tides seems to be a rye beer cross-bred with a summery golden ale – it’s illuminated, malty and balanced. Out of the three beers, it most brings to the fore the best of my experiences with cask rye. I have had this via that dispense before and compared it to itself on key keg. 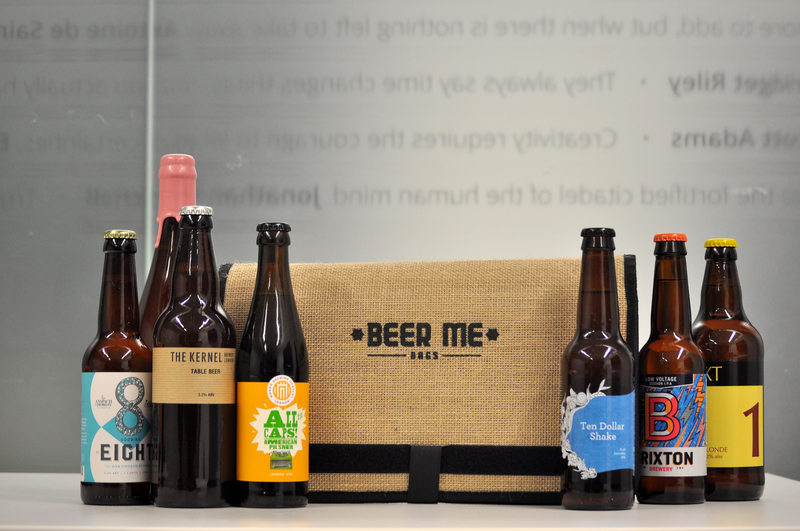 Cask is hands-down the best way to experience it. 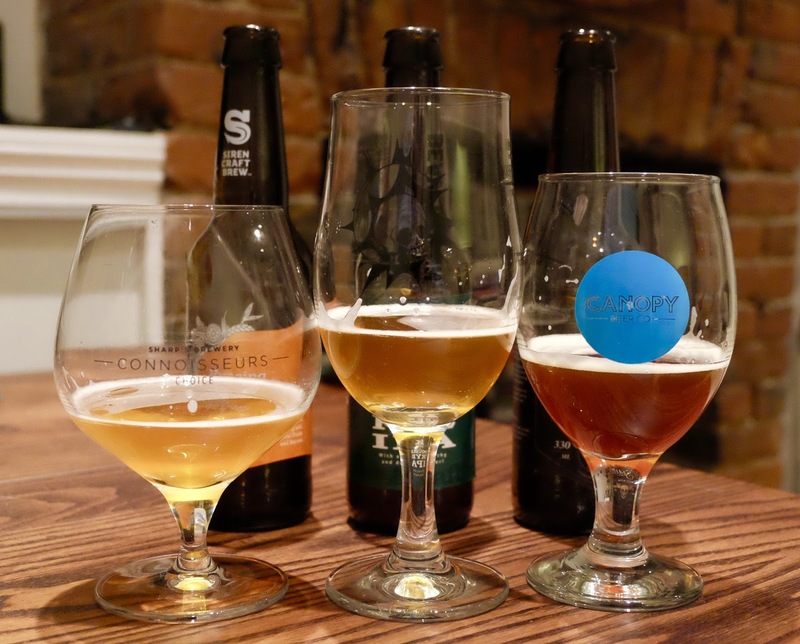 If this vertical tasting had been from tap, it almost certainly would’ve won. In my opinion, Rye Smile doesn’t carry its own alcohol. There’s a difference between feeling the blushing-cheek effects of alcohol and actually tasting it. All ales were drank neat in this experiment. If I’d matched this beer with a garishly sweet almond flapjack or paired it with something like an intimidating stinky blue cheese, it might’ve worked as a balance between aggressors. Kees Double Rye IPA does not in any way feel like you’re drinking an ale with an 8.5% ABV soccer punch. It has levity. It has an easy-drinking refreshment. It ends dry, making you want to slake your thirst again. It stays lifted right to the end – even into the yeasty sludge. A lot of experience has gone into this. It’s the first time I’ve ever had a beer by Brouwerij Kees and it’s the winner in this heavy rye shoot-out. Seek it out!